That branch growing from the base of the trunk — that’s the little devil. It’s not a branch of Cara Cara navel orange; it’s rootstock. Almost every citrus tree you can buy from a nursery (the main exception being Meyer lemon) is actually two trees in one. There is a rootstock on the bottom, and there is a scion on top. The scion is the part that gives you the fruit you desire. Usually you can spot the union where the rootstock and scion were grafted together because the bark has a change in shape there, sometimes an extreme bump but sometimes only a subtle line. Can you see the graft union on my tree above? It’s just below where the branches start. It looks a bit like a “V”. Beware. If the rootstock on a citrus tree sends up a branch, often referred to as a sucker, it will be vigorous and it will eventually take over the whole tree. Within a couple years, you’ll find that all of your tree’s fruit tastes sour, and that’s because it’s not really your tree’s fruit — it’s not the scion’s fruit, that is. It’s rootstock fruit. So keep an eye out, and cut any rootstock suckers off immediately. 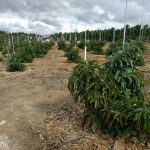 Your fruit tree is grafted — why and so what? what if I just noticed that the only green branches I’ve got are 3 rootstock suckers and the branches above it are all now brown and appear dead? Is this tree dead and beyond help? it’s a 3 yr old Bearss lime that I’ve kept in a container. I take it outside in the summer and bring inside during the winter here in Maryland. please help! Yeah, sad to say, but unless you want to graft onto those suckers then the tree will never recover as a Bearss lime. You’ll most likely get strange sour orange fruit from the suckers eventually. I’d just buy a new Bearss lime and start fresh. Hi! 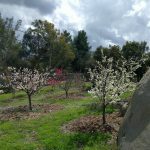 I just bought a house with some fruit trees and am learning so much from your blog. Thank you! I noticed one tree that I thought was an orange but looks like there is a thick branch with lemons splitting off from the bottom of the trunk. Do you think this was rootstock that wasn’t removed or more intentional? The orange tree has lost a lot of leaves from the top and is looking yellow. I would share a picture but I can’t figure out how. Thanks! So lucky that your new house has fruit trees! Unfortunately, it does sound like that citrus tree has a rootstock sucker that is trying to take over the orange part of the tree. Good assessment. I’ll send you an email and you can reply with a photo so I can give you a better idea of what you’re dealing with. So glad you found me! Yes, cut out the rootstock sucker immediately. The scion branches will grow very well without that competition, and the tree should recover fine. I seem to have someone of similar issue as mentioned by others. I have a clementine plant and I notice the main branch is kind of dead with no leaves. But there are 3-4 branches coming out from the very bottom of the plant. Can I email you the picture before I try to remove them? New home owner. Can you look at pictures of my tree and give me guidance please. The top recently fell over due to the weight of the fruit that was growing. I have been researching sucker branches for awhile now, your website has been most helpful. I have a ponderosa lemon tree that I recently purchased from a nursery. I cannot be certain where it’s union graft is, I’m worried I may have sucker branches but I am nervous to prune them. I was hoping I could send you a photo for your advice. 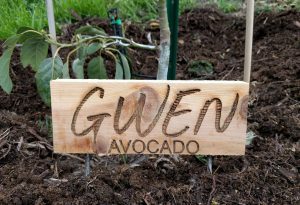 I have a few fruit trees that my husband and I planted over a year ago in our front yard. I am a little worried about my lemon tree and orange tree. could I send you a couple of pictures so you could help me figure out if they are still ok? I think the orange has those root shoots but I am not sure and I am afraid of cutting them and killing it. The one that worries me the most is the lemon tree. It doesn’t seem to grow at all especially compared to the other trees that were planted at the same time. We had to move it because it was too close to the other tree but my husband was pretty good at not cutting roots, we have given it fertilizer and everything grows around it, beautiful and strong weeds (that I constantly remove) and mushrooms, but not the tree. It has tiny lemons but they do not develop. Send a couple photos to greg@gregalder.com and I’ll do my best. I know you’re mainly talking about citrus but my in-laws have a 8 year old apple tree that they complain doesn’t really give fruit. I checked it out and it definitely has one maybe two suckers that have completely grown out and have probably been there for years. Would that be an issue like citrus? Yes, it’s the same for all grafted fruit trees. I’ve seen it on apples, avocados, peaches, plums, and more. If you can, identify the rootstock suckers on that apple and cut them out so that the scion (desired fruiting trunk) gets all of the energy, sun, and space. Just a bit of background. I have lived in Southern Arizona for over 40 years. I have owned homes with landscaping I have maintained. 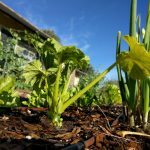 I was a Certified Nursery Consultant at a local Home Depot for years. 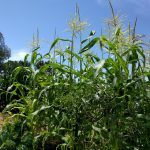 I was on my HOA landscape committee for years where I learned about large scale commercial landscaping. I now watch homes in the summer for Canadian snowbirds. Trees die in Arizona in the summer. My customers seem to think I was not checking the irrigation and increasing it enough. The customer is asking all sorts of questions I am not qualified to answer. I have seen over and over where snowbirds have found the graft dead and cut it off and said the tree was fine and coming back. I don’t want to get involved in discussions about what they should do, but I am tired of being blamed for acts of God. If the fruit-bearing graft is dead, should the tree be removed, or can it be kept as a healthy ornamental? Interesting conundrum you find yourself in. Most definitely, a citrus tree that has only rootstock still alive can be kept as a healthy ornamental. My neighbor has three or four just like that: beautiful, vigorous, fragrant, but with worthless fruit. i’m so glad i read about this. 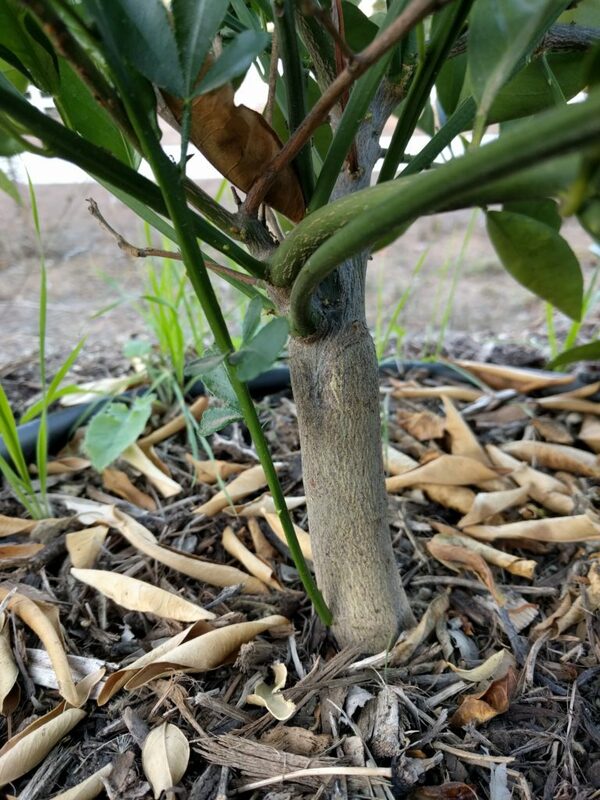 i have a question trying to find the graft area on my mature meyer lemon tree. i’m wondering if the rootstalk has taken over to the point of no return and if we need to remove the tree and start over? 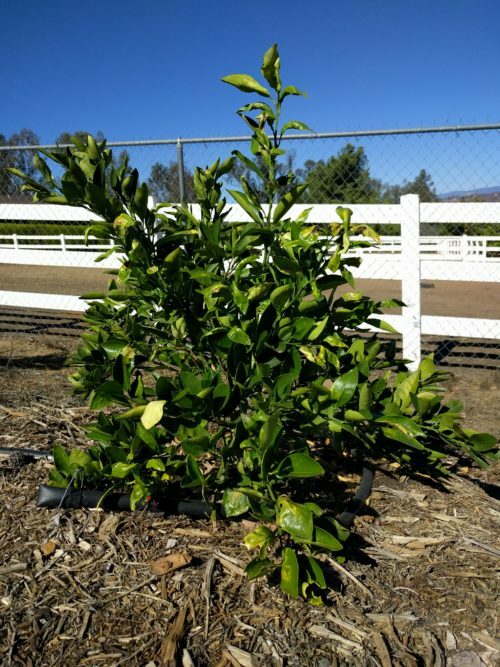 Meyer lemon trees often don’t have rootstocks. They are often grown from cuttings. So don’t be surprised or concerned if you can’t find a graft union. If the fruit on your tree is the Meyer lemons you expect, then you probably have no rootstock sucker problem. Hi Greg. I planted 4 Satsuma citrus trees last year which are growing fine. My question is. On the trees some of the branches are normal round and there are some branches are long in triangle shape is this normal growth on Satsuma trees?. It’s is the folage of the tree not below the graft. Should I remove these weird branches or leave them?. Thanks. Citrus trees do that, including Satsumas. My young Satsuma has a few angular branches; even my big old Valencia orange tree gets some of them. Hi, I have an orange tree I planted 16 years ago. It’s abkht 16 feel tall and until this year has provided tons of amazing fruit. I’ve always fought with what I know now is a thorny sucker which bears huge, misshapen fruit. The three has to main branches coming from the trunk. The real tree and the sucker. To get rid of the sucker I’ll oretty much have to slice the tree down the middle. Is this feasible? Can I email you a picture? Thank you! You can probably still cut that sucker out, but you’ll have to be careful to paint any newly exposed, bare branches afterward (paint with white latex), especially if the branches face south or west. Doing the pruning in the late winter is probably also ideal because the sun is weak and the tree will start growing new leaves about then.